From Fort Collins to the state capital of Denver, Colorado is home to a variety of colleges. Public universities, private colleges, community colleges, seminary schools, a military academy and popular online programs are just a few of the state's higher education options. Having so many colleges and universities improves Colorado students' chances of finding one that fits their needs, but sorting through them can be a tricky endeavor. This guide features rankings of the top Colorado colleges, a search tool and other important factors one can use to evaluate schools and plan for college. Finding the right college calls for careful research and consideration of one's needs. No single Colorado college is perfect for every student; however, our rankings show which Colorado colleges possess the best overall educational quality and value for students based on factors such as alumni earnings, tuition, student-to-teacher ratio and graduation rate. Learn which colleges in Colorado are leading the way in the rankings below. This search tool that can help aspiring Colorado college students further narrow their options using characteristics such as tuition, enrollment, college type and degree level. It also allows them to compare up to four schools side-by-side to find which one suits their needs at a glance. When it comes to education quality and opportunity, not all future college students start on a level playing field. Some groups face an uphill climb, which results in poorer student outcomes. This federally-funded program helps minority, low-income and first-generation college students get college-ready. GEAR UP advisors recruit remedial students in middle school and continue to mentor and advise them through high school and college. The program also offers scholarships, pays for college courses available to high school students and helps students earn college credit for skills learned outside the classroom. This is a Colorado Department of Higher Education program designed to help underserved Colorado students receive the education necessary to compete in tomorrow's workforce. The initiative funds several programs with the goal to make college attainable and affordable to all students: they provide funding, services and encouragement to motivate students through college and into the workforce. It offers Matching Student Scholarship Grants, bridge programs for high school students, mentoring, career services and community workforce programs. The Colorado Legislature established the College Opportunity Fund (COF) connect students with financial aid. This stipend-based program pays a portion of new and returning students' in-state tuition, public or private, so long as they formally apply and meet all eligibility criteria. The Legislature sets stipend amounts annually. College Costs: How Does Colorado Compare? When choosing a college, it's important to take a look at tuition costs. Factors such residency, institution type, course load and financial aid received all affect how much one pays for a Colorado college degree. The following information shows how Colorado institutions compare to schools across the country based on average of tuition, percentage of students receiving financial aid, and the amount they receive. Tuition and fees may not be the only things that dictate college affordability, but they certainly contribute. Another important consideration: financial aid. Grants, scholarships and loans can have a significant impact on one's ability to pay for college, yet some institutions offer more aid than others. 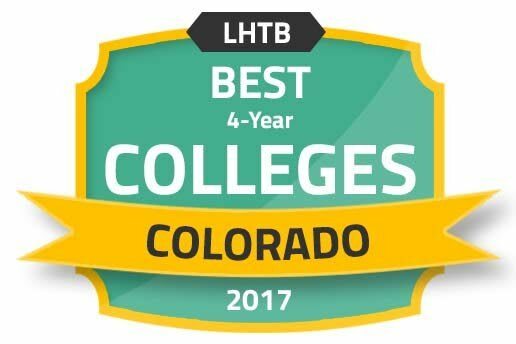 The following ranking highlights the most affordable colleges in Colorado based on net price, or total cost minus typical financial aid benefits. The personal impact of college cost is a matter of expense versus one's ability to repay it. Some colleges' graduates earn more, on average, than others. Comparing individual Colorado colleges' alumni earnings can help prospective students identify schools that improve their financial outlook. The following section pinpoints colleges with the highest alumni salaries ten years after graduation. The rising costs of getting a college education can be discouraging for potential students. Since tuition varies depending on location and the type of school, it pays to consider which Colorado colleges' students graduate with the least amount of student loan debt. The national average is also provided for comparison. What Does It Cost to Live in Colorado? Living costs vary greatly by state, region and city. Finance-savvy students factor this into their college budgets. This section compares average costs of living across the five most populous Colorado cities. Choosing an accredited college in Colorado is important because it ensures the school has met certain quality standards in areas like faculty, curriculum and facilities. Accreditation comes into play when students need to transfer credits from one college to another, apply for federal and state financial aid, obtain professional licensing and apply to graduate programs. Institutions can be accredited either holistically or programmatically, and on a national or regional basis. For example, the Higher Learning Commission (HLC) of the North Central Association of Colleges and Schools (NCA) gives accreditation to Colorado schools and others in the region. The following are examples of organizations accrediting specific college programs. Accreditation Board for Engineering and Technology (ABET): The Engineering Accreditation Commission (EAC), a part of ABET, accredits several Colorado engineering schools, including those at the University of Colorado at Boulder, the United States Air Force Academy and the Colorado School of Mines. The Council on Academic Accreditation (CAA) in Audiology and Speech-Language Pathology: The CAA accredits Speech-Language Pathology (SLP) and Audiology programs at the University of Colorado at Boulder and the University of Northern Colorado. Boulder is considered one the nation's best college towns. It is a highly livable city for both students and graduates, with strong art and food scenes, innovative public transit, walking and bicycle trails, and a variety of employment opportunities such in teaching, health care, technology, science and more. Boulder has two universities, several trade schools, community colleges, and a variety of private, non-traditional specialized schools. Naropa is an accredited private, liberal arts college with approximately 950 annual enrollments and a student-to-teacher ratio of 11:1. Naropa offers an alternative to traditional universities by combining rigorous academics, experimental learning and contemplative practice with a curriculum influenced by Buddhist philosophies. In addition to undergraduate and graduate degrees, Naropa offers online courses, low-residency degrees and study abroad opportunities. Students can pursue degrees in subjects such as art therapy, early childhood education, music, writing and literature, environmental studies, and contemplative psychology. UC Boulder, founded in 1876, is considered the flagship university of the University of Colorado system. It is a public, four-year institution serving almost 31,000 students each year with an average student-to-teacher ratio of about 18:1. UC Boulder is known as a public research and teaching institution, with projects ranging from aerospace to health. Students can participate in research, community outreach, sports, student groups and recreation. This centrally located, two-year community college enrolls approximately 10,200 students a year, many of which are first-generation college students, non-traditional students and veterans. CCD offers hybrid, online and alternative credit options; and academic services such as technical tutoring; career advising; and on-campus health and child care. Popular programs include health professions, liberal arts and sciences, general studies, and humanities. MSU Denver is a four-year public university based downtown. MSU is recognized nationwide for its diverse student population, ranking high for graduating students of color. The Business, Psychology and Protective Services programs are popular here, and the college recently received awards for its Sales Education and STEM programs. Annual undergraduate enrollment is about 22,000 with a student-to-teacher ratio of 19:1. MSU tuition is also lower than most four-year Colorado colleges. Regis University is a non-profit, four-year Jesuit college with four campuses metro-wide. In addition to strong academics, the school offers a NCAA Division II athletic program, an emphasis on student involvement in community service, and a small student-to-teacher of 14:1. Regis University's business, education, and online computer technology programs are among the most popular. Below are several Colorado resources to make aspiring students' transition to college easier. This website contains helpful information on subjects such as college planning, financial aid, testing, college admissions, Colorado colleges and workforce transition for adults. Advancing Students for a Stronger Economy Tomorrow (ASSET) assists undocumented students with financial aid issues and college planning. The website has a section for exploring colleges in Colorado. The CCHE is a Colorado State commission promoting college affordability and access. Its website offers data and information on college policies and financial aid; student support; and more. Students can find out more information about the network of 13 Colorado community colleges, such as details on each college, student resources, programs and costs. Power Up Colorado provides information for careers in Colorado's energy industry, like how to get the right education and industry-specific and financial aid programs.